The shortest day and the end of the Mayan world, at least according to popular internet memes unsupported by rigorous academic study. Whatever, for this little weasel the time has come. I'm really surprised a cat managed to bring this evasive small predator in and wonder if it was already ill or had been discarded by some other hunting animal. They didn't want to eat it but left it with the post on the mat, identifying where many other unsolicited offerings are made. We had never seen such a creature so closely before, they move so quickly in the wild and are very shy. You can never be sure quite what you've seen, just a flash of rusty brown that might be weasel, stoat or even a red squirrel in a hurry although the preferred habitats are not very similar. To find one on the edge of a built up area seems very unusual but I suppose this was hunting the same small rodents the cats do. 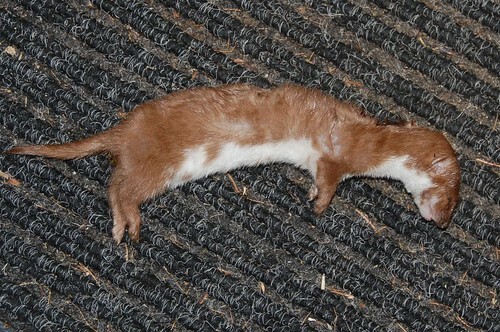 You can read more about weasels here, including the worst joke in the world.